The Mazdaspeed3 hasn’t been on sale since 2013, but don’t despair because Mazda could be cooking up a new hot version of the Mazda3 to rival the Golf GTI. According to Autocar, the high-performance Mazda3 could get the green light by 2021. Multiple engine options have been considered, but it’s most likely going to use the turbocharged 2.5-liter four-cylinder that powers the CX-5 and Mazda6. This unit produces up to 250 hp and 310 lb-ft of torque. This would be a significant improvement over the current Mazda3’s aspirated 2.5-liter four-cylinder engine that pumps out 186 hp and 186 lb-ft of torque. No word yet if the hot Mazda3 will be offered with front or all-wheel drive, but the latter seems like the more likely option. "The Mazda 3 is a light vehicle, so if there is too much power and we keep it as front-wheel drive, there is the torque steer phenomenon happening,” said Mazda3 program manager, Kota Beppu. Transmission options are also being kept under wraps. While the high-performance Mazda3 hasn’t been given the green light yet, insiders insist that it’s simply a "formality.” Beppu is also keen to see it enter production. 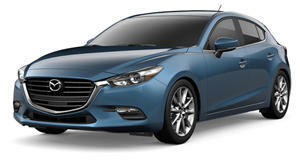 "I’m a car guy, so I myself want to drive a high performance Mazda 3… I’ll do my best,” he said. Beppu added there is keen interest for a hot Mazda3 in the "most developed countries”, including the US, Japan and Australia. Beppu added that he doesn’t see a high-performance Mazda 3 as a track monster, as there will still be an emphasis on comfort and everyday road use. "It needs to be responsible and friendly… more friendly than a Golf GTI,” he said, adding: "it should be fast” and referring to the car as a "hyper” Mazda 3 rather than a hot hatch. If it does get the green light, it will be interesting to see if the Mazdaspeed brand gets revived.